The pubis, or pubic bone, is one of the bones that make up the pelvis. It is ventral and anterior. In other words, it is at the front in humans, and below in most other mammals. The left and right hip bones join at the pubic symphysis. In the female, the pubic bone in front is covered by the urethral sponge. This is a layer of fat, forming the mons pubis or mons Venus. 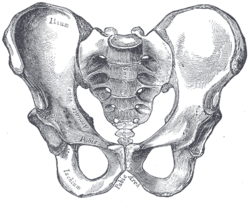 The body of the pubis forms one-fifth of the acetabulum, the area around the hip socket. It contributes to the hip socket itself. Its inner surface is part of the wall of the lesser pelvis. Right hip bone. Seen from outside. Right hip bone. Seen from inside. Plan of ossification of the hip bone. Symphysis pubis exposed by a coronal section. Left Levator ani from within. Left hip-joint, opened by removing the floor of the acetabulum from within the pelvis. The arteries of the male pelvis. SUNY Labs 44:st-0713 - "The Male Pelvis: Hip Bone"
This page was last changed on 4 July 2018, at 11:49.